It is the most humbling and awe-inspiring realization for me, that our very lives are dependent upon the tiny creatures we pass by every day, hardly noting their existence as they softly buzz from plant to plant. They may seem insignificant, and barely noticeable, but their quiet power is keeping the entire planet going. This was quite a concept shift for me. I grew up terrified of flying bugs & especially bees. When I stepped on one as a child, my foot swelled so much from the sting that I couldn’t walk on it for a day. I’ve run, screaming, from them ever since. Life conspired to change my mind. Now, I see the bee in a totally different way, a much more feminine way. The Jerry Seinfeld movie got it all wrong! Males bees only leave the hive once, and that is to mate with the queen. Then they die. The real worker bees are the females. 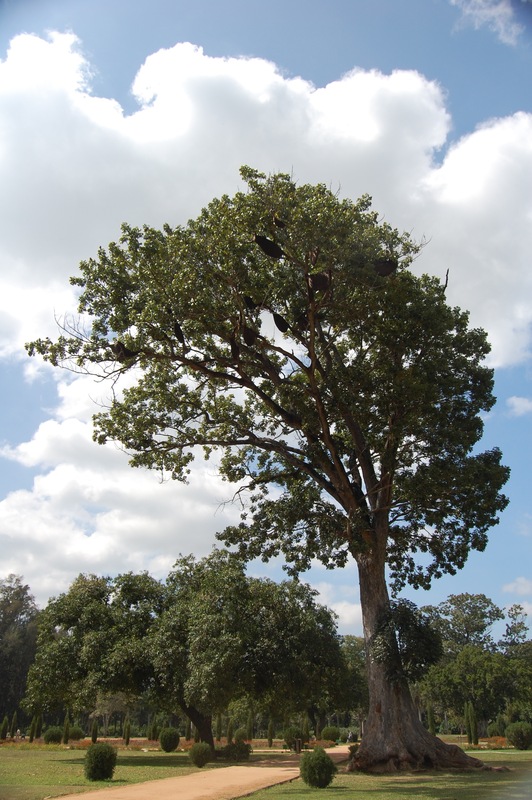 When they fly by you on a sunny day, they are focused on their sole mission: to find food for their family. They do not want to attack you and will generally leave you alone unless they feel threatened. After walking through warehouses full of flying bees, and standing in front of hundreds of hives, & sustaining not an injury, I can truly attest to this. In the U.S. honeybees are so important because of pollination. Bee pollination is responsible for over $15 billion dollars of crops yearly, especially specialty crops like nuts, berries, fruits, and vegetables. It is estimated that 1/3 of our food directly or indirectly comes from bees, butterflies, bats birds or other pollinators. That’s 1 out of every 3 bites. Wanna list of foods pollinated by bees? I don’t know about you, but for me, this list includes most of my favorite foods! Meat eaters are not off the hook, because bees pollinate some of the crops animals eat, too. 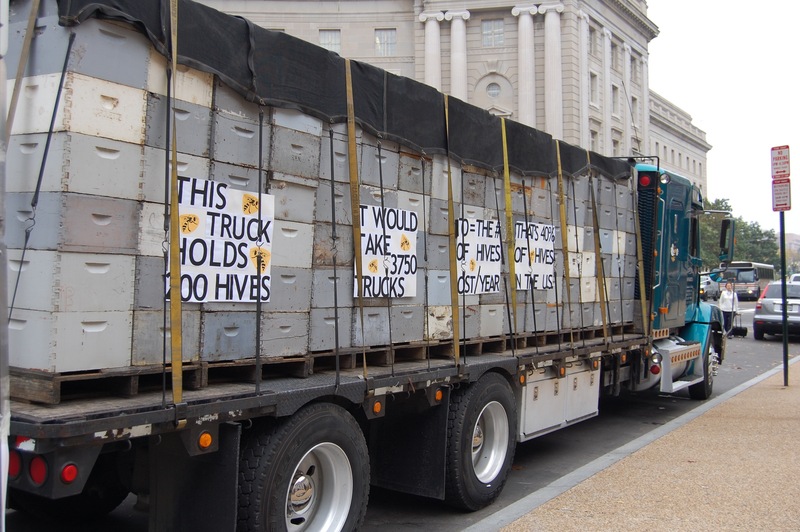 In order to meet this demand bees are trucked all over the country. Any harm to the bees is a real threat to our food supply. Because of their sensitivity honeybees are considered an indicator species. They respond early to problems in ecosystems. Honeybees can give us a good indication of what’s happening to North America’s over 4,000 species of native bees along with a whole lot of other pollinators including: beetles, butterflies, bats, and hummingbirds, and other birds and insects. (Honeybees aren’t native to this continent. They were brought over by the European colonists and Spanish missionaries in the 1600’s to make wax for candles and for honey.) 90% of all flowering plants rely on pollinators. 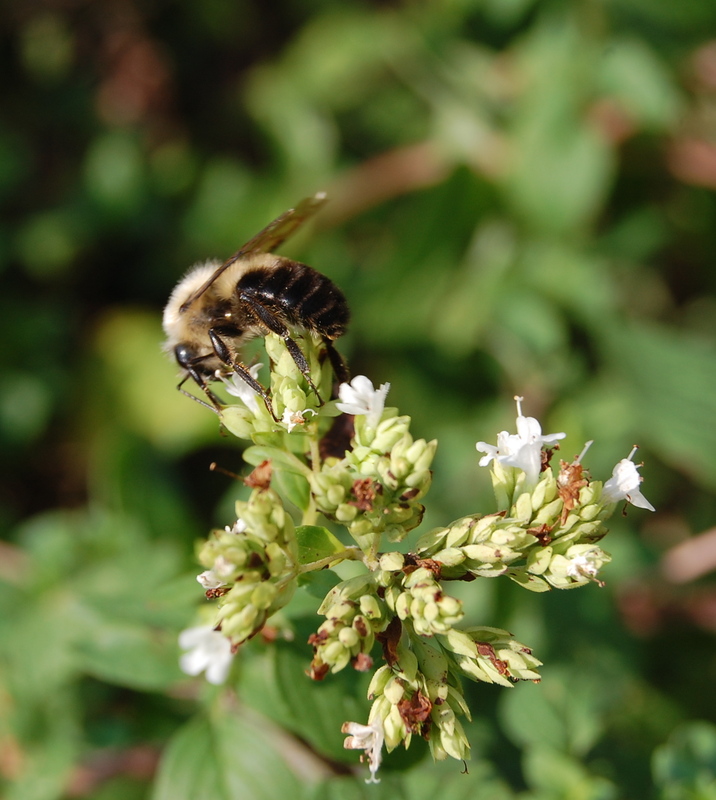 Pollinators are crucial for the reproduction of many types of plants. In return those plants provide food and shelter for other species. Without the pollinators most ecosystems would simply collapse. Humans depend on those ecosystems to survive. We have a tendency to isolate ourselves from the ecosystems that sustain us, but even city dwellers are reliant on nature working properly in order to survive. Fresh air, clean water, abundant food, are all the result of healthy ecosystems. Even the material goods we purchase are made with products of healthy ecosystems. how much of this food was pollinated by a pollinator? 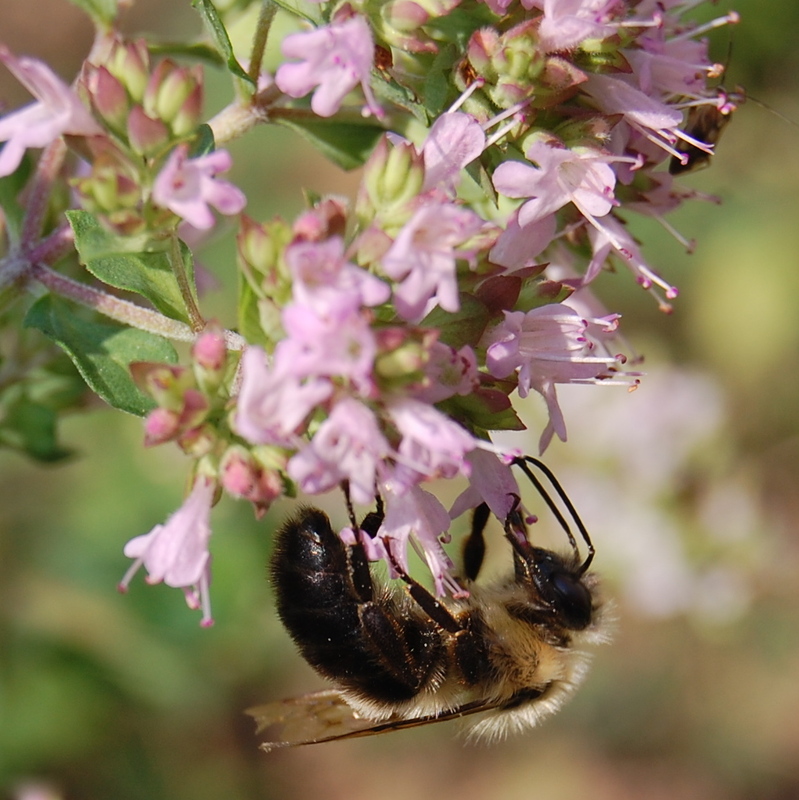 Although the U.S. Department of Agriculture says we are facing an “impending pollination crisis” noting that both managed and wild pollinators are disappearing at an alarming rate and attributing that to pesticides such as insecticides and herbicides, reduced availability of nectar, parasites, grazing, invasive species, and destruction of habitat, there exists no formal programs to study these losses. Neonics are systemic. They are applied to the seed, and then grow throughout the entire plant rendering it toxic to insects. For people who still find comfort in washing the pesticides off their produce, it needs to be understood that this new class of pesticides cannot be washed off. In studies, sub-lethal doses of these pesticides have caused the same symptoms in bees as CCD. Despite studies coming in from all over the world showing neonicotinoids to be a real problem for bees, and petitions signed by at least 2 million people expressing their concern over these pesticides, the EPA has not acted. It is a misconception that the EPA tests these pesticides for safety before bringing them to market. The laboratory studies done to determine product safety are done by the companies making billions of dollars a year off of the pesticides (the manufacturers). The problem spreads further. Universities are allowed to accept funding from the companies of the very products they are testing. Some major universities even have stock in such companies. Then there’s the revolving door problem, so common between government agencies and the corporations they are supposed to be watching. Former chemical company executives hold high-level EPA positions. All of this amounts to a huge conflict of interest that’s been largely unaddressed, at the expense of the public and the bees. 6 years later, not much has changed for the honeybee. Beekeepers experienced 40% losses this year. The beekeepers we talked to last week are barely hanging in there- this is not a sustainable situation! Our government and governments around the world have failed to act in so many ways. But there is hope. There are real, substantial actions we could be taking right now to help save the bees and our world. Just banning a class of pesticides is not enough- we need to transform our relationship with the pollinators on the planet. If enough people care we can be a huge catalyst for change. 1. Go for Natural Solutions in Your Yard. According to the NAS, although farmers use pesticides more widely, homeowners use 10 times more per acre. Yet, only about 5-15 percent of the bugs in your yard are pests. “Good bugs,” like the ground beetle and the green lacewing, help control pests. Beyond Pesticides has solutions for common bug problems that don’t involve pesticides. Safe Lawns has how to videos and other ideas for natural lawns as well as a resource directory for eco-friendly products and services. Did you know that Quebec, along with over 140 Canadian municipalities, has banned the use of both pesticide and herbicides for cosmetic applications on lawn and gardens? Ontario, concerned about the lack of testing on the cumulative effect of so many different chemicals being used at the same time, did the same thing Earth Day 2009, citing “the rights of kids to play in the grass… without compromising their health.” Home Depot pulled all herbicide and pesticide products from their shelves in Canada years ago. 3. 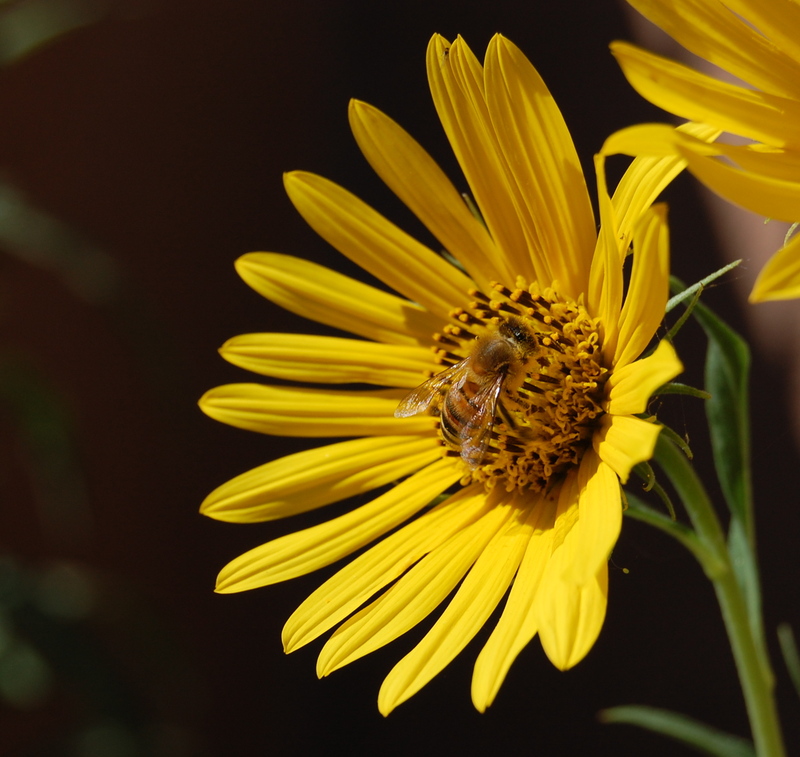 Plant a Pollinator Garden! U.S. 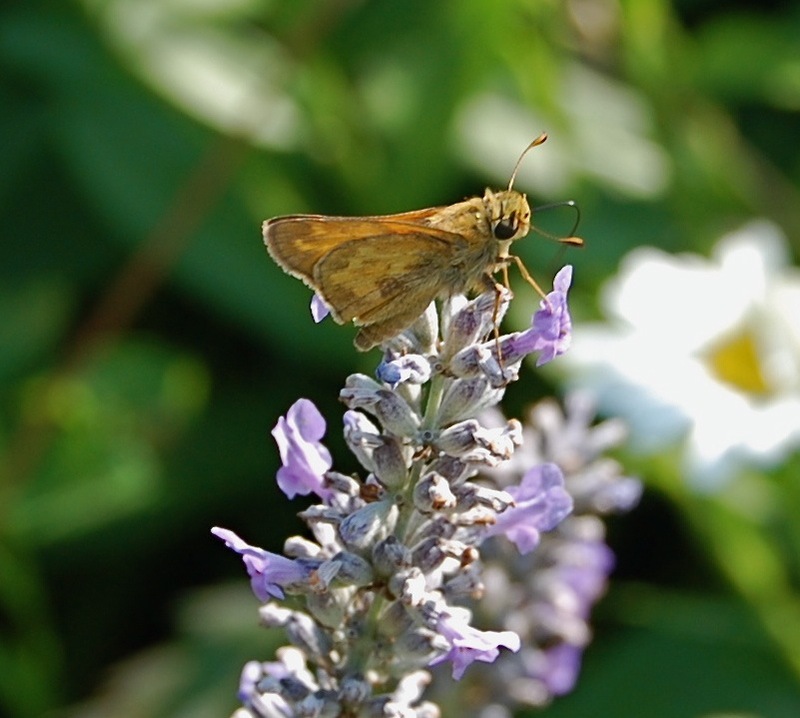 Fish & Wildlife Services has a table that provides information on the types of flowers that different pollinator groups (bats, hummingbirds, bees, butterflies, etc.) find attractive. Here are some tips from their website: By planting a garden with a wide range of plants that will bloom in succession, you can offer pollen and nectar to pollinators throughout the growing season. 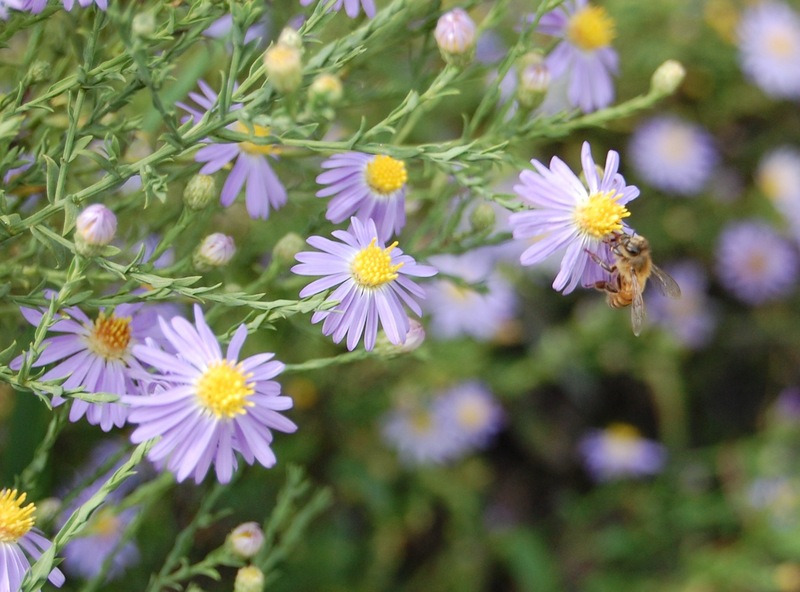 Use native plants whenever possible, although some garden plants are bee-friendly. Choose several colors, especially attractive to bees are blue, purple, violet, white, and yellow. Plant the species of flowers in little clumps. Include flowers of different shapes, this will provide benefit for many different types of bees, and make sure a diversity of plants are flowering all season. 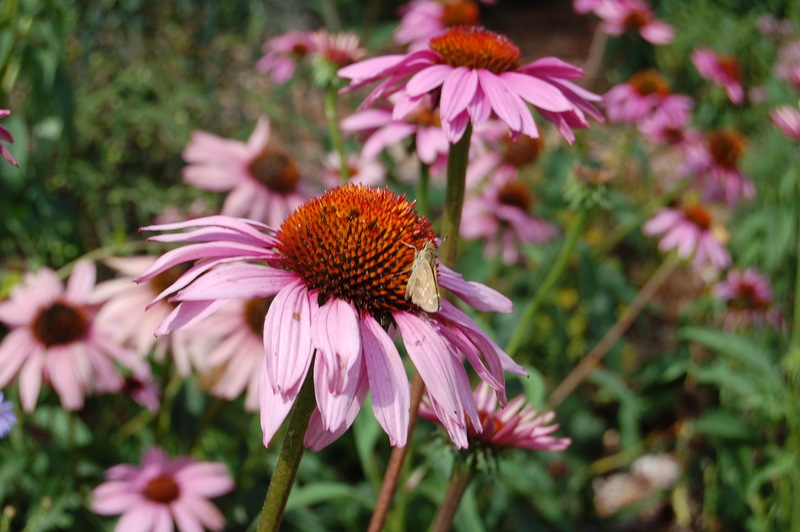 North American Pollinator Protection Campaign has pollinator friendly planting guides. You can enter your zipcode into their webpage and they will help you select plants for your eco-region. 3. Turn Your Yard into a Wildlife Habitat! Your lawn could be a special place that provides a sanctuary for wildlife, avoids toxic chemicals, saves water from run-off, improves soil, air, and water quality and helps fight global warming. Commercial and residential development destroy eco-systems, this can be your way of bringing some back. A wildlife habitat has the four basic elements wildlife need: food, water, cover, and places to raise young, plus sustainable gardening. Food sources are native plants, seeds, fruits, nut, berries and nectar. Water sources could be birdbaths, ponds, water garden, streams. Places for cover could be a thicket, rock pile, or birdhouse. 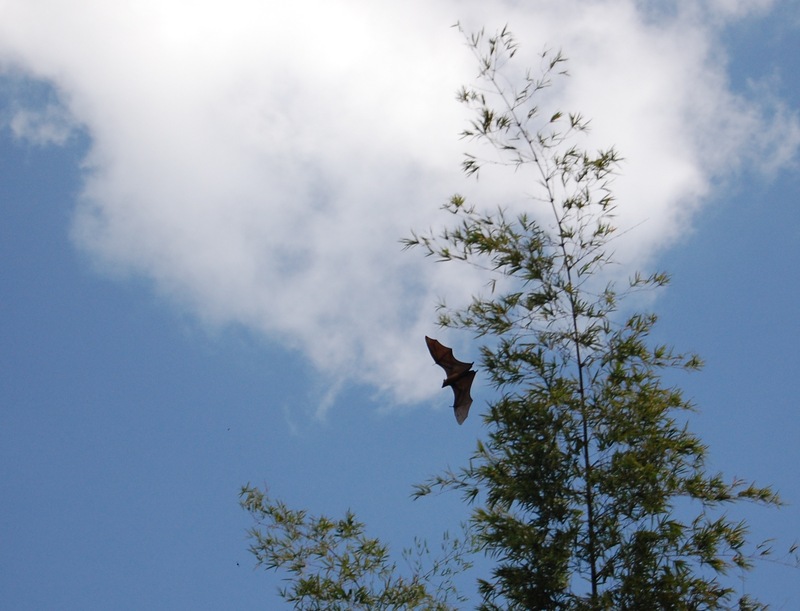 Places to raise young include: dense shrubs, vegetation, nesting box, a pond. Sustainable gardening includes mulch, compost, rain garden, and chemical-free fertilizer. A Wildlife Habitat yard is fun, especially for children. Your habitat may attract all sorts of interesting wildlife, including bees, birds, and other pollinators. Native wildflowers, shrubs, and trees will increase the beauty of your property while providing shelter. Add bird baths and bird feeders, benches, pathways, and other lawn accents, and you can create a yard that is both practical, beautiful, and beneficial to the planet. You will save time and money you’d normally spend on mowing and fertilizing grass. Once you get certified the National Wildlife Federation can give you an attractive Certified Wildlife Habitat sign that you can display to educate your neighbors about your commitment to wildlife conservation and the environment. In many places this brings about community involvement, and it is possible to make a community wildlife habitat. 4. Buy organic food (or grow it yourself). Don’t forget to set aside pollinator corridors. 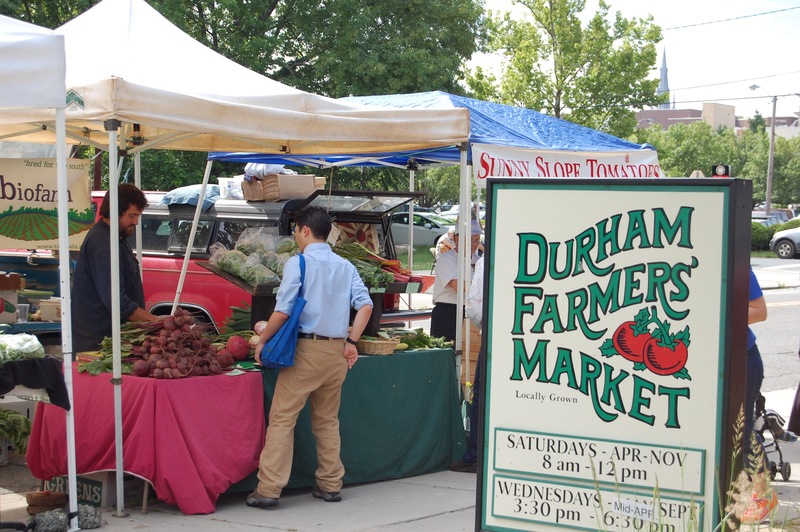 If enough people want safely grown food, we can change the way agriculture operates for good! 5. I might also mention the benefits of appreciating & buying raw, local, organic honey. 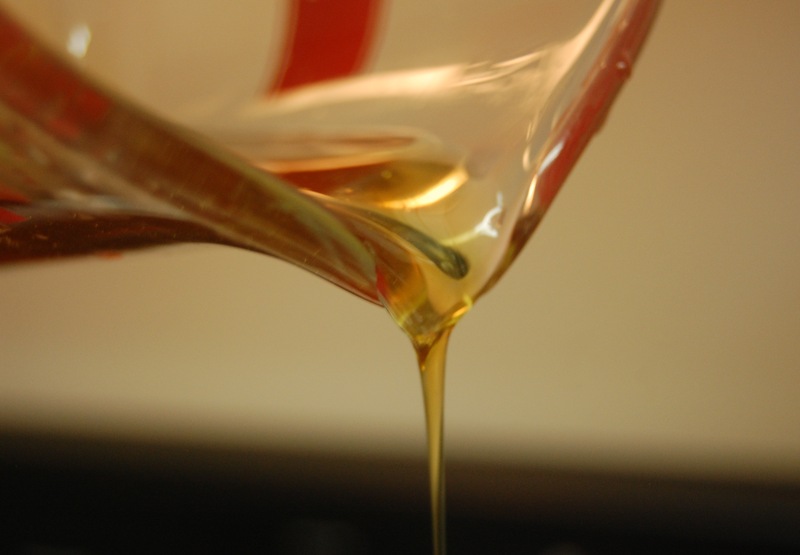 Raw honey is filled with beneficial enzymes. It’s anti-bacterial, anti-fungal, anti-viral. We use it in my house anytime one of us is feeling sick & we hardly ever feel sick for long. I’ll share one of my favorite recipes soon! 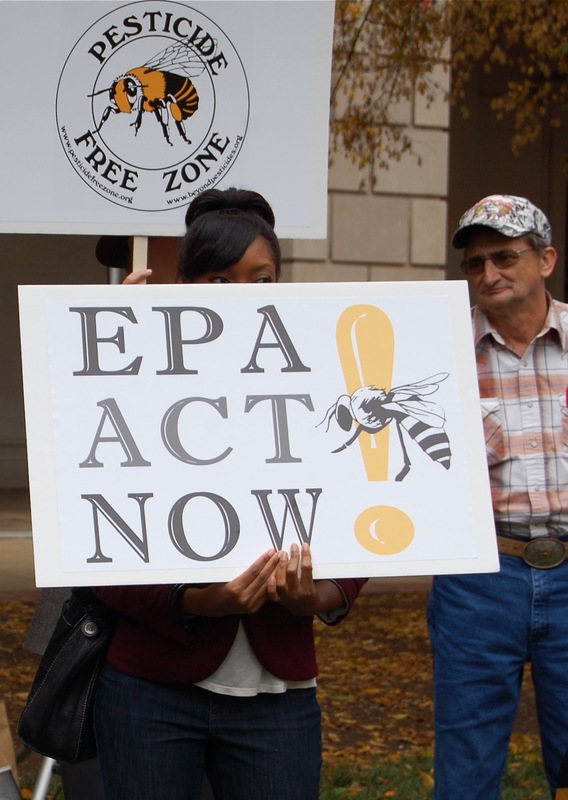 At a rally for the bees in front of EPA headquarters last week, Kevin and I were honored to meet the most amazing people. They are working hard to protect the bees, and ensure that Americans have the most basic of needs, a working food supply. Groups like the Center for Food Safety and Beyond Pesticides and PANNA. Check them out. 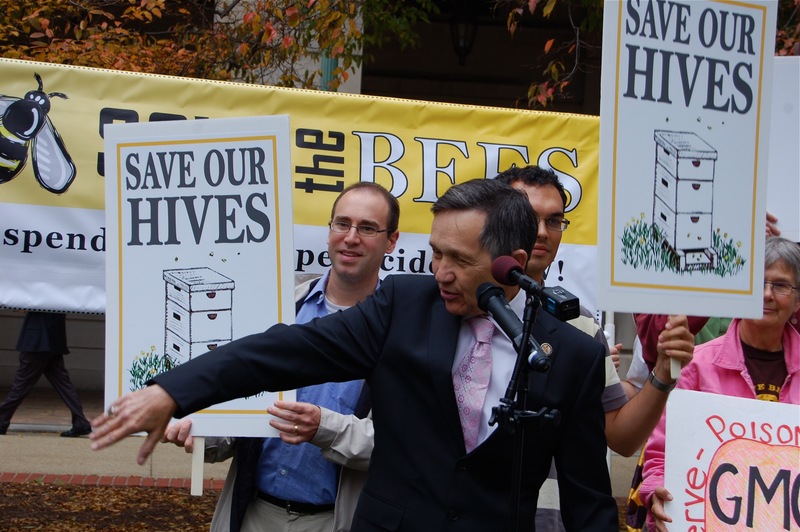 Dennis Kucinich spoke at the rally- he and his wife have top bar hives of their own! For even more info: watch our movie, Nicotine Bees. Or Maryam’s movie Vanishing of the Bees. And also, Michael Shacker has written an excellent book on this subject, Spring Without Bees. 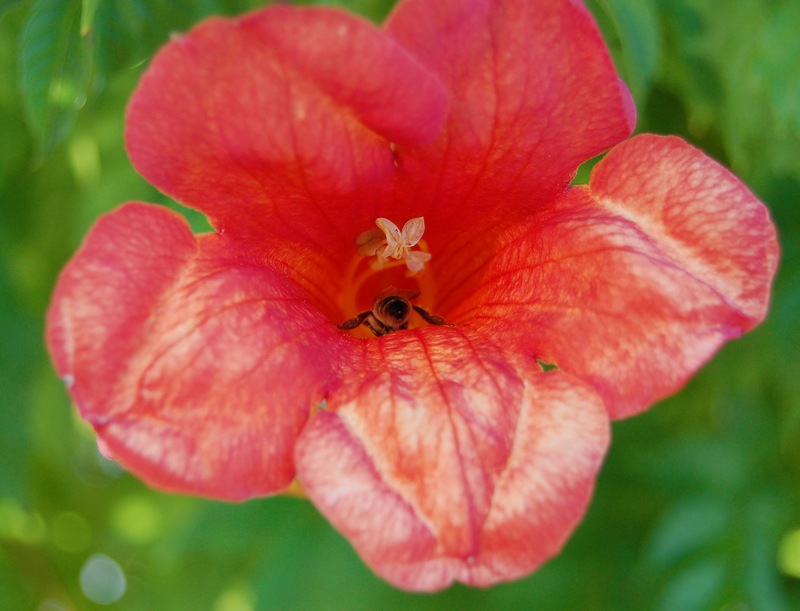 There’s also the Pierre Terre Honeybee Blog. And so much more! Whew! Sorry for the long post. I guess after 5 years, I have a lot to say. I’d always believed we’d come a little further than we have in realizing how important bees are to our food supply & our existence. But I have faith in the human species. I think maybe we just forgot for a while, our connection to the bees that have preceded us humans here on earth by 10 to 20 million years. It doesn’t take much to appreciate all the bees do for us. Then, if you’re anything like me you’ll be photographing bees, and then gushing over pictures of their fuzzy little bodies covered in pollen, stocking up on raw honey & beeswax candles, buying mead for your wedding, and writing long-winded blog posts about saving the pollinators! I very much liked you post because I have the same sentiments on bees. Your images are very lovely, but in your first photo I am pretty sure that is a Drone Fly and not a bee. They are common on the daisy shown. On my site I featured a recent post on the drone fly with macro shots of it in the garden, that is why I was sure of the ID. I very much liked your thorough look at bees. I just looked at your site & I can see why you saw it right away. You have some great photos there of pollinators. A really beautiful blog! thanks! Hmm… contact details- didn’t realize they weren’t there. Will have to work on that!